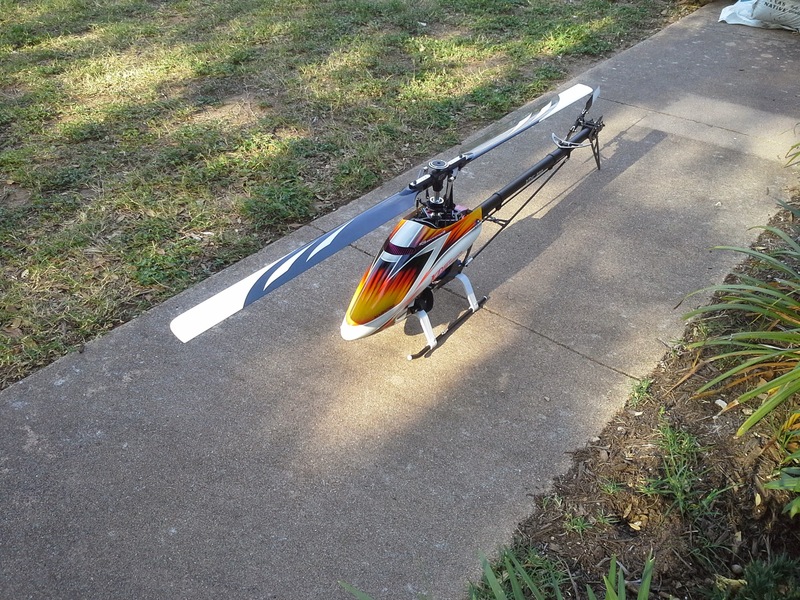 Thanks to Allen Womack – the US team manager for KDS, and HelicopterHobbies.com, we were given the opportunity to build and fly the KDS 550 combo package then give it away to a lucky attendee of the 2013 RCTS Funfly! The KDS brand doesn’t have a lot of recognition here in the USA, so it should be no surprise that I’d never seen one in person before starting this review. I read what I could in the forums, but there wasn’t a lot of activity. I even found a few forum discussions claiming it was a Logo clone, so I wasn’t sure what to expect! When the box arrived, I was pleasantly surprised to find a nicely packaged heli with nice looking blades and electronics neatly packed. As is typical these days, the manual was on a mini disc, rather than being printed. Unfortunately, it is also a fairly typical manual consisting of mainly pictures, with very few words. If you’ve built a few helicopters this may not bother you, but if this is your first build you may need some assistance from a friend with experience. On the plus side, the complicated bits are pre-assembled (sans threadlock) so you can at least see how it’s supposed to look. Just be sure to degrease the hardware before applying threadlock to be sure it’s effective. The build went very well with only one mechanical issue: While trying to tighten the first of four grub screws that retain the landing skid tubes in the struts, the screw bound up and the head stripped out long before actually getting to the tube. Argh! I drilled out the other three holes in the skids to a larger size, and was able to install the grub screws successfully. Our kit was missing the shim washers for the tail blades. Without them, the blades are a loose fit in the tail grips. No problem, I made some washers from a plastic butter dish lid and the thickness was perfect. We got the full combo kit, so it included servos, motor, ESC, and the new V2 version of the KDS Ebar Flybarless unit. The cyclic servos are metal gear, digital units that seem to have good speed and centering. They are also HV, so you can run a 2S LiFe or LiPo pack directly if you choose, rather than using a BEC. The tail servo is plastic geared and not HV, so if you run a LiPo pack you’ll need a step-down regulator. I was assured by Allen that the tail servo could handle LiFe voltage, so that’s what I set it up to do. Servo installation went well, nothing unusual to report. The included motor is a hefty and seemingly well-built motor. The shaft already has a flat spot for the pinion retaining screw, a nice touch. 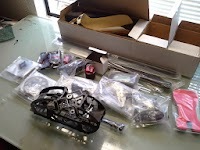 There were no surprises installing the motor, and all hardware is included. 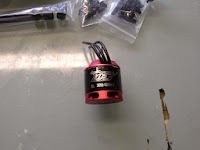 It is worth noting that you do have to solder on the (included) bullet connecors, both to the motor and the ESC. KDS uses the same ESC in the 550 and 600, so it’s a bit overkill in the 550 since it’s a 120 amp HV unit! However, it fits fine and this heli needs the nose weight so it’s not a problem. Setting up the Ebar was a pleasant surprise! It uses a small programmer box for all setup and adjustment, with no computer needed. The only downside I can see to this approach is if you want to own more than one Ebar, you will eventually end up with a box full of progammers since they come with every Ebar! Ours was an early V2 unit, but I had a V1 manual. That made for a few head scratchers, but I figured it out. One thing that did surprise me is that if you choose not to use an external receiver, the Ebar only supports a single Spektrum satellite (DSM2 only, not DSMX). It does support SBus, so that’s an option if you fly a brand that uses SBus. However, considering that their unit is designed to be used in 550+ size helis it’s baffling why they did not include the ability to plug at least two Spektrum satellites directly into the unit to reduce wire clutter. The lack of support for DSMX is also surprising. If you are a Spektrum user, there is a nice option for an external receiver that will keep the wiring to a minimum and that’s the new “carbon fuselage” AR6260. This receiver doesn’t need satellites, and has two easy-to-route antennas to get the clear shot you need, away from the carbon frames. Since you need only run two wires from the Ebar to an external receiver, your wiring will be very clean. At any rate, even though I had a new V2 unit and no V2 manual it was easy enough that I got it working pronto. It even flew, but I’m getting ahead of myself. Well, not really because the build is complete and it’s time to talk about the flying! The first flight took place at James’ place, since I finished it just before heading up there for a funfly. This worked out great, because I knew he’d be able to give it a much more thorough thrashing in the air than I could! To be honest, I was a little nervous since this wasn’t my heli, it was an unknown FBL unit, unknown ESC and unknown airframe. But… it worked! The ESC has a great soft start and slow spoolup, just flick out of throttle hold into a flatline throttle setting and it starts up soft as you please. Liftoff was smooth, and even the tail gain seemed right on. We made a few tweaks to the settings for expo and agility, but this was mainly for personal preference. The stock settings were perfectly flyable. It was on the second flight, and James’ first go at it, that we encountered our only major issue: After rolling in and unloading the head, James pushed it out with hard negative and we heard a strange sound…” uh oh” says we, and a quick landing was made. A quick look at the heli revealed the source of the noise: Three missing teeth on the main gear! A few texts with Allen and we had a likely cause. According to Allen, the pinion needs to be meshed very tightly to the main gear. This was not noted in the instructions, so I meshed it the same as I would any other heli of this size. James and I also had a suspicion that it could be the pinion itself, since upon closer examination the included pinion seems to have a tooth profile that is very blunt and doesn’t make deep contact with the main gear teeth. This, combined with the mesh I set, equaled a stripped gear! Allen corresponded with KDS about our gear strip episode, and they are of the opinion that there is no issue. Well, our experience seemed to indicate otherwise! If you mesh the stock pinion super tight as Allen / KDS recommended it can be hard on the motor bearings, and can cause power consumption to increase. To us, that didn’t really seem like a good solution. We also theorized that a better pinion might do the trick. The Rhino steel pinion for the T-Rex 600 is the correct modulus, and costs only a couple of bucks. The tooth profile on the Rhino is much sharper, and the mesh with the main gear is much better. We have also taken the opportunity to install and fly the Rhino pinion on our lucky winner John Denton’s KDS 550 and the mesh is much better. It also runs noticeably quieter. It is our opinion that this is the better solution, but one could also follow the advice of KDS and just mesh the stock pinion tight and let it wear in. Your choice. Either one works! Now, with that out of the way, you probably are wondering how it flies? In a word: Great! The Ebar was surprisingly good, with no cyclic wobble on hard stops. Pirouette performance is excellent, as is the overall “feel” of the controls. After setting the expo and rates to our preferences, James and I were both immediately comfortable with it and were flying it as if it were an old friend. The belt drive tail has a softer sound than torque tube gears, so overall the KDS 550 has a great sound. The stock blades were another pleasant surprise. They were well balanced, tracking is good, and they fly well with a sharp and crisp feel. Best of all, they are just silly cheap, costing less than the 353mm blades I use on the Mini Protos! For this review, we’ve had several different guys fly two different KDS 550s, and I’ve asked them to share a few words about the heli. The KDS 550 has a larger diameter tail boom than you would expect to see on a helicopter swinging 550mm blades, yet it does not look out of place. The styling of the frame, landing gear and canopy combine together for a clean and sporty design. Without a doubt this is the best bang for the buck I have found. With great prices on kits and parts this would make a great helicopter from beginners to the most advanced pilots. 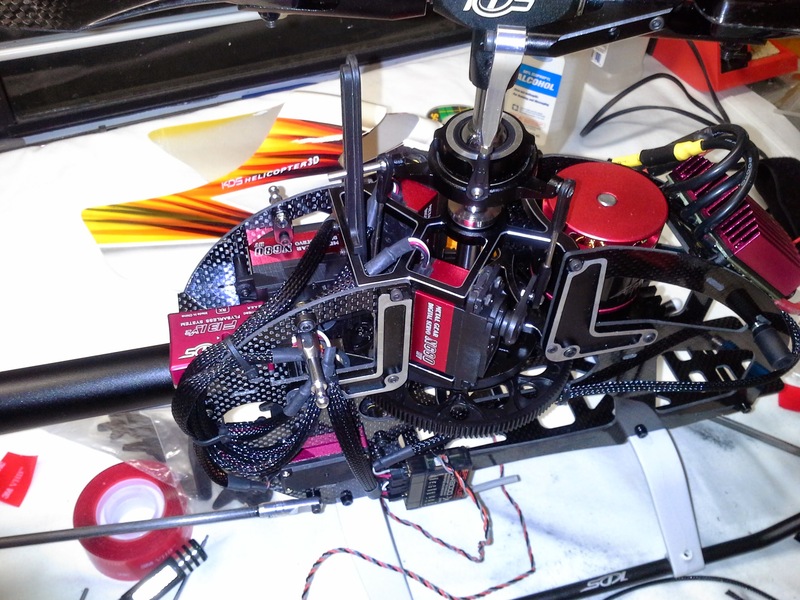 The 550 that I have been flying has the included motor, esc, servos, flybarless unit and blades. So basically it is completely stock and I can tell you there is not a reason to change it. Right out of the box the helicopter has the power and performance for the hardest smack 3D. There may be some that want to run a wide range of headspeeds, and for this I would recommend going with a flybarless unit that incorporates a governor. I am a huge fan of battery trays and unfortunately the KDS doesn’t have one. The battery area is large enough for even my 6s 5300mah packs. In the beginning I used a rubber pad between the battery and frame for friction. It worked just fine, but I feel better with Velcro. So I decided to put a 1” square of Velcro near the front and rear of the battery. I did the same on the tray in the corresponding locations. This is my preferred method as I do not have to worry about the battery sliding, and it only contact the Velcro when it is in the correct location. Unfortunately I could not score this as high as I would have liked. Only a few retailers have picked up the KDS line, so you are limited in where you can get the parts. The good news is that during the review and testing I regularly checked those sites and parts were in stock on the vast majority of items. At this point it appears that a helicopter should not be down due to parts availability. The 550 holds up extremely well. If you fly really hard and with high headspeed, there is a chance you may have issues with stripping a main gear every now and then. Luckily they are easy to change and are super inexpensive. The KDS 550 flies really well, especially when you consider the price. It has excellent power for a 6S setup. The servos seem fast and torquey with no issues. The tail felt solid and locked in though it blew out once during a fast inverted backwards pass. The model feels very connected however I noticed that a slight elevator bobble in hard stops. This could probably be tuned out with a little work. The blades felt very aggressive with crisp cyclic feel and a nice sound. All in all the KDS 550 flew great and is a bargain for someone looking for a solid 550 sized heli for a great price. It is hard for me to say what my initial impressions of the KDS 550 were because we were struggling with a few issues. First off, the gear stripping issue. This clouded my initial first impression of the helicopter and FBL unit. After we got past that issue, we were faced with trying to figure out what did what in the FBL controller. We were given a beta unit that was not yet released and we were working with a manual for a totally different version. So this kind of gave me a little bit of the “stink face” when thinking about how it was going. After a few flights making changes, we hacked our way through it and figured out what we were dealing with and how to change it to our liking. 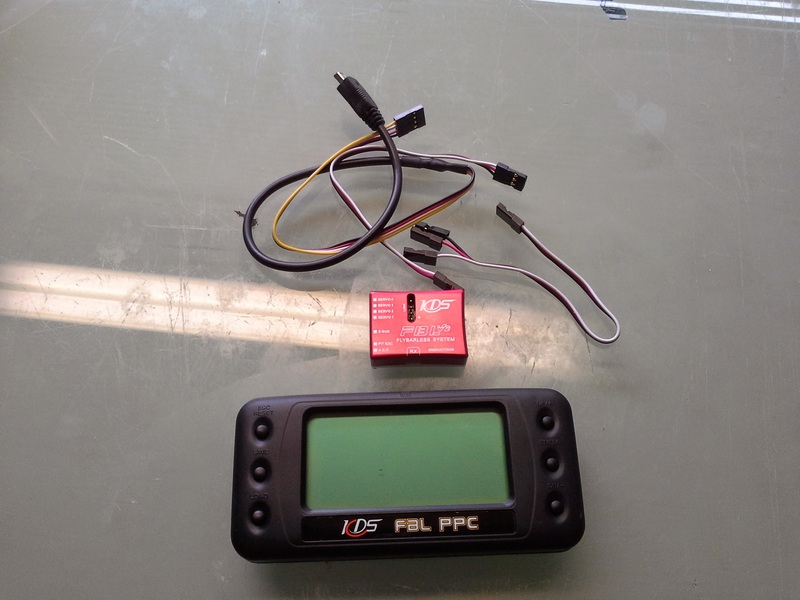 After that, I was really impressed with the helicopter and the FBL unit. The helicopter did not have any weird tendencies. We were able to tune the unit so that it felt very locked in. It flew as commanded and was very stable while doing it. The stock motor is very strong and took all we could throw at it. The ESC held the head speed very consistent and I am not really sure we even had the governor turned on. It could have very well just been the strong motor keeping the head speed consistent. The servos centered well and gave a very smooth control to the helicopter. Stops were crisp. Performing smooth maneuvers was done flawlessly. When I look at the entire package, there is really not much bad I can say about it. I would recommend this package to just about anyone at any skill level. It will not disappoint. I think you can probably tell by this point that all of us ended up with a favorable view of the KDS 550. It looks good, flies good, and the combo is an amazing value. KDS is also releasing the new Agile 700 heli very soon, and rumor has it a new 550-600 size with the multi-stage drivetrain an other features of the Agile 700 will follow shortly. To me, this is a good sign that KDS isn’t going to perform a disappearing act anytime soon. If they continues to improve their dealer network in the USA, it will make KDS an even more appealing helicopter brand. I would buy one if I were shopping for a replacement 550.